Hi There, I just wanted to remind you there is still time to get into the Raisin Boat Challenge. This month it is an easy challenge. Just make a thank you card using any stamp set you have. If you use a Raisin Boat stamp it will could for two. My dear friends helped me celebrate my birthday. I made these thank you cards to show them how much I appreciate them. Here is a video of what I did. Accessories: Memento Ink: Rich Cocoa, Action Wobble Spring, Old dictionary, googly eyes. I hope you will join the Raisin Boat Challenge. You have until Dec 12th. Ohhhhhhhh these are just adorable!!!!! cute and I am really loving anything with book print on it these days! lol your chics are adorable! 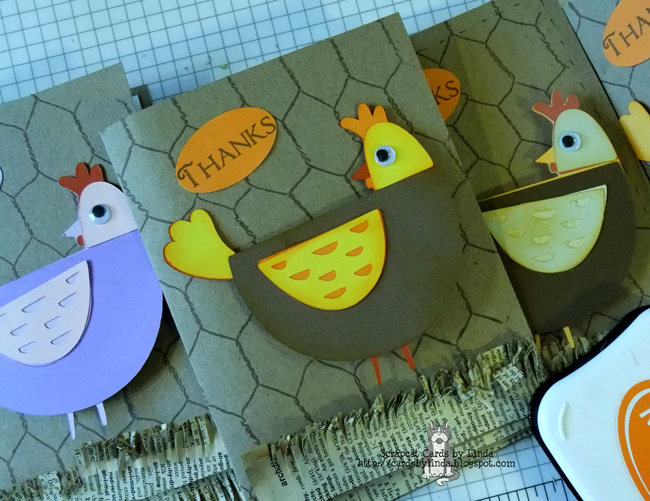 These are gorgeous thank you cards Linda - I love the chickens and the wire background is perfect!! Hi Linda these look terrific super images and design I do like how you have done the grass effect. Linda I want to thank you for your lovely comment on my blog it means so much to me.